§ 1. AMONG the countless analogies by which the nature and relations of the human soul are illustrated in the material creation, none are more striking than the impressions inseparably connected with the active and dormant states of matter. I have elsewhere1 endeavoured to show, that no inconsiderable part of the essential characters of Beauty depended on the expression of vital energy in organic things, or on the subjection to such energy, of things naturally passive and powerless. § 3. But when we begin to be concerned with the energies of man, we find ourselves instantly dealing with a double creature. Most part of his being seems to have a fictitious counterpart, which it is at his peril if he do not cast off and deny. Thus he has a true and false (otherwise called a living and dead, or a feigned or unfeigned) faith. He has a true and a false hope, a true and a false charity, and, finally, a true and a false life. His true life is like that of lower organic beings, the independent force by which he moulds and governs external things; it is a force of assimilation which converts everything around him into food, or into instruments; and which, however humbly or obediently it may listen to or follow the guidance of superior intelligence, never forfeits its own authority as a judging principle, as a will capable5 either [191/192] of obeying or rebelling. His false life is, indeed, but one of the conditions of death6* or stupor, but it acts, even when it cannot be said to animate, and is not always easily known from the true. It is that life of custom and accident in which many of us pass much of our time in the world; that life in which we do what we have not proposed, and speak what we do not mean, and assent to what we do not understand; that life which is overlaid by the weight of things external to it, and is moulded by them, instead of assimilating them; that, which instead of growing and blossoming under any wholesome dew, is crystallised over with it, as with hoar-frost, and becomes to the true life what an arborescence is to a tree, a candied agglomeration of thoughts and habits foreign to it, brittle, obstinate, and icy, which can neither bend nor grow, but must be crushed and broken to bits, if it stand in our way. All men are liable to be in some degree frost-bitten in this sort; all are partly encumbered and crusted over with idle matter; only, if they have real life in them, they are always breaking this bark away in noble rents, until it becomes, like the black strips upon the birch tree, only a witness of their own inward strength.7 But,8 with all the efforts that the best [192/193] men make, much of their being passes in a kind of dream, in which they indeed move, and play their parts sufficiently, to the eyes of their fellow dreamers, but have no clear consciousness of what is around them, or within them; blind to the one, insensible to the other, [Greek word]9 I would not press the definition into its darker application to the dull heart and heavy ear; I have to do with it only as it refers to the too frequent condition of natural existence, whether of nations or individuals, settling commonly upon them in proportion to their age. The life of a nation is usually, like the flow of a lava stream, first bright and fierce, then languid and covered, at last advancing only by the tumbling over and over of its frozen blocks. And that last condition is a sad one to look upon. All the steps are marked most clearly in the arts, and in Architecture more than in any other; for it, being especially dependent, as we have just said, on the warmth of the true life, is also peculiarly sensible of the hemlock cold of the false: [193/194] and I do not know anything more oppressive, when the mind is once awakened to its characteristics, than the aspect of a dead architecture. The feebleness of childhood is full of promise and of interest, the struggle of imperfect knowledge full of energy and continuity, but to see impotence and rigidity settling upon the form of the developed man; to see the types which once had the die of thought struck fresh upon them, worn flat by over use; to see the shell of the living creature in its adult form, when its colours are faded, and its inhabitant perished, this is a sight more humiliating, mpre melancholy, than the vanishing of all knowledge, and the return to confessed and helpless infancy. 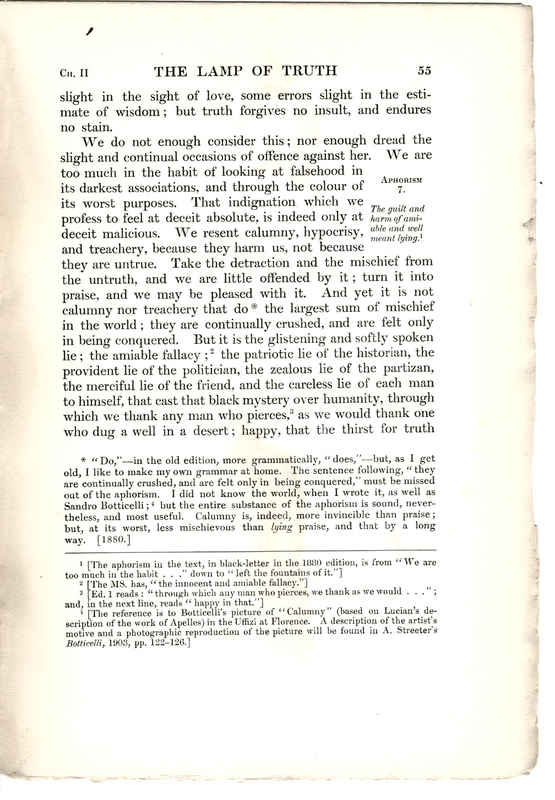 § 4. Now,12 in the first place and this is rather an important point it is no sign of deadness in a present art that it borrows or imitates, but only if it borrows without paying interest, or if it imitates without choice. The art of a great nation, which is developed without any acquaintance with nobler examples than its own early efforts furnish, exhibits always the most consistent and comprehensible growth, and perhaps is regarded usually as peculiarly venerable in its self-origination. But there is something to my mind more majestic yet in the life of an architecture like that of the Lombards, rude and infantine in itself, and surrounded by fragments of a nobler art of which it is quick in admiration and ready in imitation, and yet so strong in its own new instincts that it re-constructs and re-arranges every fragment that it copies or borrows into harmony with its own thoughts, a harmony at first disjointed and awkward, but completed in the end, and fused into perfect organisation; all the borrowed elements being subordinated to its own primal, unchanged life. I do not know any sensation more exquisite than the discovering of the evidence of this magnificent struggle into independent existence; the detection of the borrowed thoughts, nay, the finding of the actual blocks and stones carved by other hands and in other ages, wrought into the new walls, with a new expression and purpose given to them, like the blocks of unsubdued rocks (to go back to our former simile13) which we find in the heart of the lava current, great witnesses to the power which has fused all but those calcined fragments into the mass of its homogeneous fire. § 5. It will be asked, How is imitation to be rendered healthy and vital ? Unhappily, while it is easy to enumerate the signs of life, it is impossible to define or to communicate life; and while every intelligent writer on Art has insisted on the difference between the copying found in an advancing or recedent period, none have been able to communicate, in the [195/196] slightest degree, the force of vitality to the copyist over whom they might have influence. Yet it is at least interesting, if not profitable, to note that two very distinguishing characters of vital imitation are, its Frankness and its Audacity: its Frankness is especially singular; there is never any effort to conceal the degree of the sources of its borrowing. Raffaelle carries off a whole figure from Masaccio, or borrows an entire composition from Perugino,14 with as much tranquillity and simplicity of innocence as a young Spartan pickpocket;15 and the architect of a Romanesque basilica gathered his columns and capitals where he could find them, as an ant picks up sticks. There is at least a presumption, when we find this frank acceptance, that there is a sense within the mind of power capable of transforming and renewing whatever it adopts; and too conscious, too exalted, to fear the accusation of plagiarism,16 too certain that it can prove, and has proved, its independence, to be afraid of expressing its homage to what it admires in the most open and indubitable way; and the necessary consequence of this sense of power is the other sign I have named the Audacity of treatment when it finds treatment necessary, the unhesitating and sweeping sacrifice of precedent where precedent becomes inconvenient. 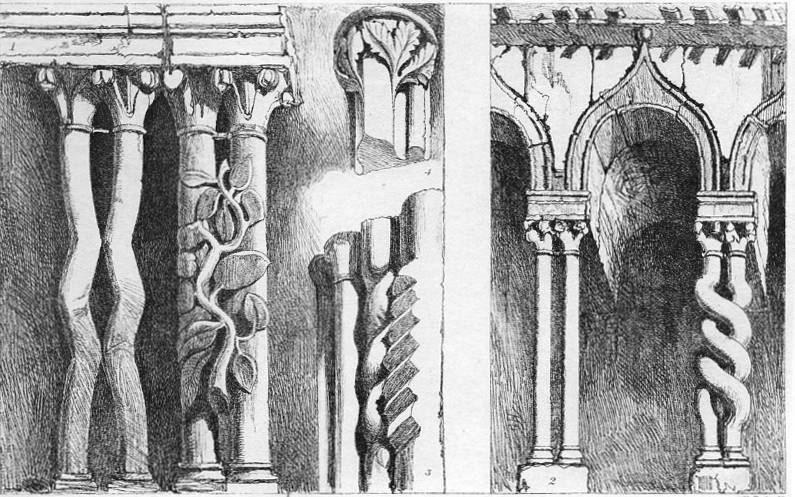 For instance, in the characteristic forms of Italian Romanesque, in which the hypaethral portion of the heathen temple was replaced by the towering nave, and where, in consequence, the pediment of the west front became divided into three portions, of which the central one, like the apex of a ridge of sloping strata lifted by a sudden fault, was broken away from and raised above the wings; there remained at the extremities of the aisles two triangular fragments of pediment, which could not now be filled [196/197] by any of the modes of decoration adapted for the unbroken space; and the difficulty became greater, when the central portion of the front was occupied by columnar ranges, which could not, without painful abruptness, terminate short of the extremities of the wings. I know not what expedient would have been adopted by architects who had much respect for precedent, under such circumstances, but it certainly would not have been that of the Pisan, to continue the range of columns into the pedimental space, shortening them to its extremity until the shaft of the last column vanished altogether, and there remained only its capital resting in the angle on its basic plinth. I raise no question at present whether this arrangement be graceful or otherwise; I allege it only as an instance of a boldness almost without a parallel, casting aside every received principle that stood in its way, and struggling through every discordance and difficulty to the fulfilment of its own instincts. Of these, one of the most important I believe to be a certain neglect or contempt of refinement in execution, or, at all events, a visible subordination of execution to conception, commonly involuntary, but not unfrequently intentional. This is a point, however, on which, while I speak confidently, I must at the same time speak reservedly and carefully, as there would otherwise be much chance of my being dangerously misunderstood. It has been truly observed, and well stated, by Lord Lindsay,18 that the best designers of Italy were also the most careful in their workmanship; and that [197/198] the stability and finish of their masonry, mosaic, or other work whatsoever, were always perfect in proportion to the apparent improbability of the great designers condescending to the care of details among us so characterizes despised. Not only do I fully admit and reassert this most important fact, but I would insist upon and the best perfect and most delicate finish in its right place, as a characteristic of all the highest schools of architecture, as much as it is of those of painting.20 But on the other hand, as perfect finish belongs to the perfected art, a progressive finish belongs to progressive art; and I do not think that any more fatal sign of a stupor or numbness settling upon that undeveloped art could possibly be detected, than that it had been taken aback by its own execution, and that the workmanship had gone ahead of the design; while, even in my admission of absolute finish in the right place, as an attribute of the perfected school, I must reserve to myself the right of answering in my own way the two very important questions what is finish ? and what is its right place? § 7. But in illustrating either of these points, we must remember that the correspondence of workmanship with thought is, in existent examples, interfered with by the adoption of the designs of an advanced period by the workmen of a rude one. All the beginnings of Christian architecture are of this kind, and the necessary consequence is of course an increase of the visible interval between the power of realization and the beauty of the idea. 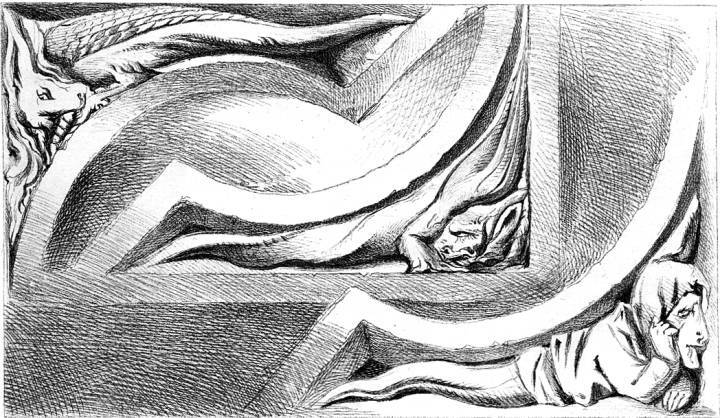 We have at first an intimation, almost savage in its rudeness, of a classical design; as the art advances, the design is modified by a mixture of Gothic grotesqueness, and the execution more complete, until a harmony is established between the two, in which balance [198/199] they advance to new perfection. Now during the whole period in which the ground is being recovered, there will be found in the living architecture marks, not to be mistaken, of intense impatience; a struggle towards something unattained, which causes all minor points of handling to be neglected; and a restless disdain of all qualities which appear either to confess contentment, or to require a time and care which might be better spent. And, exactly as a good and earnest student of drawing will not lose time in ruling lines or finishing backgrounds about studies which, while they have answered his immediate purpose, he knows to be imperfect and inferior to what he will do hereafter, so the vigour of a true school of early architecture,21 which is either working under the influence of high example or which is itself in a state of rapid development, is very curiously traceable, among other signs, in the contempt of exact symmetry and measurement, which in dead architecture are the most painful necessities. Two details from Plate XII. Left: Fig. 1. Pillar and spandrel from St. Mark's, Venice. Right: Fig. 4. The pulpit of St. Andrea at Pistoja, by Nicolo Pisanoo. § 8. In Plate XII., fig. 1, I have given a most singular instance both of rude execution and defied symmetry, in the little pillar and spandrel from a panel decoration under the pulpit of St. Mark's at Venice. The imperfection (not merely simplicity, but actual rudeness and ugliness) of the leaf ornament will strike the eye at once: this is general in works of the time, but it is not so common to find a capital which has been so carelessly cut; its imperfect volutes being pushed up one side far higher than on the other, and contracted on that side, an additional drill hole being put in to fill the space; besides this, the member a of the moulding, is a roll where it follows the arch, and a flat fillet at a; the one being slurred into the other at the angle 6, and finally stopped short altogether at the other side by the most uncourteous and remorseless interference of the outer moulding: and in spite of all this, the grace, proportion, and feeling of the whole arrangement are so great, that, in its place, it leaves nothing to be [199/200] desired; all the science and symmetry in the world could not beat it. In fig. 4 I have endeavoured to give some idea of the execution of the subordinate portions of a much higher work, the pulpit of St. Andrea at Pistoja, by Nicolo Pisano.22 It is covered with figure sculptures, executed with great care and delicacy; but when the sculptor came to the simple arch mouldings, he did not choose to draw the eye to them by over precision of work or over sharpness of shadow. The section adopted, k, m, is peculiarly simple, and so slight and obtuse in its recessions as never to produce a sharp line; and it is worked with what at first appears slovenliness, but is in fact sculptural sketching; exactly correspondent to a painter's light execution of a background: the lines appear and disappear again, are sometimes deep, sometimes shallow, sometimes quite broken off; and the recession of the cusp joins that of the external arch at n, in the most fearless defiance of all mathematical laws of curvilinear contact. There is thus a difference, severally, between 2, 3 and 4, 5, of five inches and a half in the one case, and five inches in the other. § 10. This, however, may perhaps be partly attributable to some accommodation of the accidental distortions which evidently took place in the walls of the cathedral during their building, as much as in those of the campanile. To my mind, those of the Duomo are far the more wonderful of the two; I do not believe that a single pillar of its walls is absolutely vertical: the pavement rises and falls to different heights, or rather the plinth of the walls sinks into it continually to different depths, the whole west front literally overhangs, (I have not plumbed it; but the inclination may be seen by the eye, by bringing it into visual contact with the upright pilasters of the Campo Santo:) and a most extraordinary distortion in the masonry of the southern wall shows that this inclination had [201/202]	begun when the first storey was built. The cornice above the first arcade of that wall touches the tops of eleven out of its fifteen arches; but it suddenly leaves the tops of the four westernmost; the arches nodding westward and sinking into the ground, while the cornice rises (or seems to rise), leaving at any rate, whether by the rise of the one or the fall of the other, an interval of more than two feet between it and the top of the western arch, filled by added courses of masonry. There is another very curious evidence of this struggle of the architect with his yielding wall in the columns of the main entrance. (These notices are perhaps somewhat irrelevant to our immediate subject, but they appear to me highly interesting; and they, at all events, prove one of the poi ntson which I would insist, how much of imperfection and variety in things professing to be symmetrical the eyes of those eager builders could endure; they looked to loveliness in detail, to nobility in the whole, never to petty measurements.) 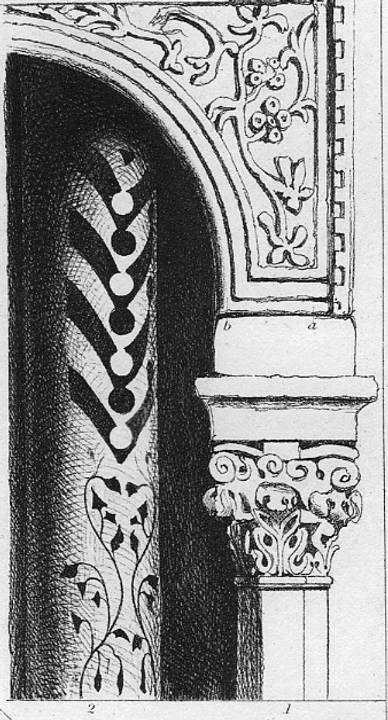 Those columns of the principal entrance are among the loveliest in Italy; cylindrical, and decorated with a rich arabesque of sculptured foliage, which at the base extends nearly all round them, up to the black pilaster in which they are lightly engaged: but the shield of foliage, bounded by a severe line, narrows to their tops, where it covers their frontal segment only; thus giving, when laterally seen, a terminal line sloping boldly outwards, which, as I think, was meant to conceal the accidental leaning of the western walls, and, by its exaggerated inclination in the same direction, to throw them by comparison into a seeming vertical. § 11. 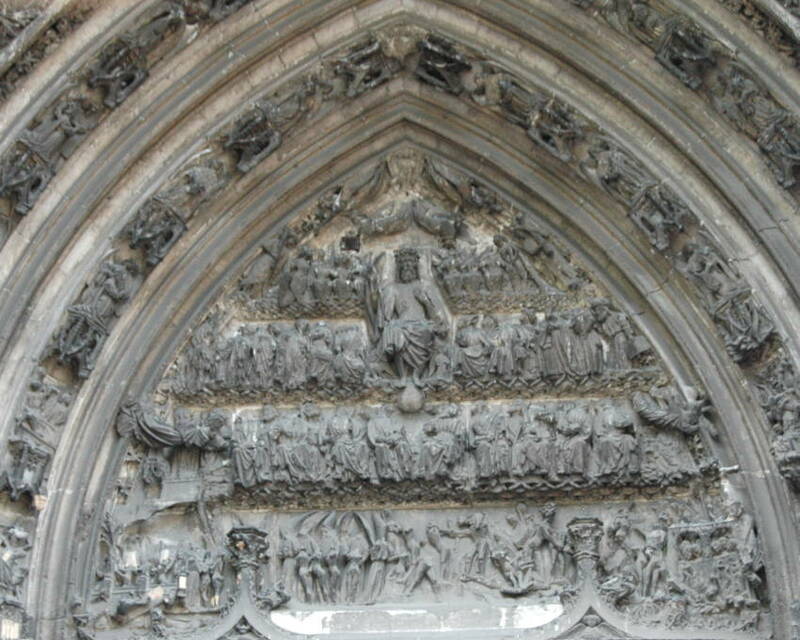 There is another very curious instance ot distortion above the central door of the west front. All the intervals between the seven arches are filled with black marble, each containing in its centre a white parallelogram filled with animal mosaics, and the whole surmounted by a broad white band, which, generally, does not touch the parallelogram below. But the parallelogram on the north of the central arch has been forced into an oblique position, and touches the white band; and, as if the architect was determined to show	[202/203] that he did not care whether it did or not, the white band suddenly gets thicker at that place, and remains so over the next two arches. And these differences are the more curious because the workmanship of them all is most finished and masterly, and the distorted stones are fitted with as much neatness as if they tallied to a hair's breadth. There is no look of slurring or blundering about it; it is all coolly filled in, as if the builder had no sense of anything being wrong or extraordinary; I only wish we had a little of his impudence. § 12. Still, the reader will say that all these variations are probably dependent more on the bad foundation than on the architect's feelings. Not so the exquisite delicacies of change in the proportions and dimensions of the apparently symmetrical arcades of the west front. It will be remembered that I said the tower of Pisa was the only ugly tower in Italy,26 because its tiers were equal, or nearly so, in height, a fault this, so contrary to the spirit of the builders of the time, that it can be considered only as an unlucky caprice. Perhaps the general aspect of the west front of the cathedral may then have occurred to the reader's mind, as seemingly another contradiction of the rule I had advanced. It would not have been so, however, even had its four upper arcades been actually equal; as they are subordinated to the great seven-arched lower storey, in the manner before noticed respecting the spire of Salisbury,27 and as is actually the case in the Duomo of Lucca and Tower of Pistoja. But the Pisan front is far more subtly proportioned. Not one of its four arcades is of like height with another. The highest is the third, counting upwards; and they diminish in nearly arithmetical proportion alternately; in the order 3rd, 1st, 2nd, 4th. The inequalities in their arches are not less remarkable: they at first strike the eye as all equal; but there is a grace about them which equality never obtained: on closer observation, it is perceived that in the first row of nineteen arches, eighteen are equal, and the central one larger than the rest; in the second arcade, [203/204] he nine central arches stand over the nine below, having, like them, the ninth central one largest. But on their flanks, where is the slope of the shoulder-like pediment, the arches vanish, and a wedge-shaped frieze takes their place, tapering outwards, in order to allow the columns to be carried to the extremity of the pediment; and here, where the heights of the shafts are so fast shortened, they are set thicker; five shafts, or rather four and a capital, above, to four of the arcade below, giving twenty-one intervals instead of nineteen. In the next or third arcade, which, remember, is the highest, eight arches, all equal, are given in the space of the nine below, so that there is now a central shaft instead of a central arch, and the span of the arches is increased in proportion to their increased height. Finally, in the uppermost arcade, which is the lowest of all, the arches, the same in number as those below, are narrower than any of the facade; the whole eight going very nearly above the six below them, while the terminal arches of the lower arcade are surmounted by flanking masses of decorated wall with projecting figures. The upper arcade is managed on the same principle: it looks at first as if there were three arches to each under pair; but there are, in reality, only thirty-eight (or thirty-seven, I am not quite certain of this number) to the twenty-seven below; and the columns get into all manner of relative positions. Even then, the builder was not satisfied, but must needs carry the irregularity into the spring of the arches, and [205/206] actually, while the general effect is of a symmetrical arcade, there is not one of the arches the same in height as another; their tops undulate all along the wall like waves along a harbour quay, some nearly touching the string course above, and others falling from it as much as five or six inches. §14. Let us next examine the plan of the west front of St. Mark's at Venice, which, though in many respects imperfect, is in its proportions, and as a piece of rich and fantastic colour, as lovely a dream as ever filled human imagination.29 It may, perhaps, however, interest the reader to hear one opposite opinion upon this subject; and after what has been urged in the preceding pages respecting proportion in general, more especially respecting the wrongness of balanced cathedral towers and other regular designs, together with my frequent references to the Doge's palace, and campanile of St. Mark's,30 as models of perfection, and my praise of the former especially as projecting above its second arcade, the following extracts from the journal of Woods31 the architect, written on his arrival at Venice, may have a pleasing freshness in them, and may show that I have not been stating principles altogether trite or accepted. After more observations on " a certain justness of proportion," and on the appearance of riches and power in the church, to which he ascribes a pleasing effect, he goes on: " Some persons are of opinion that irregularity is a necessary part of its excellence. I am decidedly of a contrary opinion, and am convinced that a regular design of the same sort would be far superior. Let an oblong of good architecture, but not very showy, conduct to a fine cathedral, which should appear between two lofty towers and have two obelisks in front, and on each side of this cathedral let other squares partially open into the first, and one of these extend down to a harbour or sea shore, and you would have a scene which might challenge any thing in existence." Mr. Woods was unable to enjoy the colour of St. Mark's, or perceive the majesty of the Ducal palace, the reader will see after reading the two following extracts regarding the Caracci and Michael Angelo. “What is it that is so much admired in this artist (M. Angelo) ? * * * Some contend for a grandeur of composition in the lines and disposition of the figures; this, I confess, I do not comprehend; yet, while I acknowledge the beauty of certain forms and proportions in architecture, I cannot consistently deny that similar merits may exist in painting, though I am unfortunately unable to appreciate them." §15. The entire front is composed of an upper and lower series of arches, enclosing spaces of wall decorated with mosaic, and supported on ranges of shafts of which, in the lower series of arches, there is an upper range superimposed on a lower. Thus we have five vertical divisions of the façade; i.e. two tiers of shafts, and the arched wall they bear, below; one tier of shafts, and the arched wall they bear, above. In order, however, to bind the two main divisions together, the central lower arch (the main entrance) rises above the level of the gallery and balustrade which crown the lateral arches. The proportioning of the columns and walls of the lower storey is so lovely and so varied, that it would need pages of description before it could be fully understood; but it may be generally stated thus: The height of the lower shafts, upper shafts, and wall, being severally expressed by a, b, and c, then a: c:: c: b (a being the highest); and diameter of shaft b is generally to the diameter of shaft a as height b is to height a, or something less, allowing for the large plinth which diminishes the apparent height of the upper shaft: and when this is their proportion of width, one shaft above is put above one below, with sometimes another upper shaft interposed: but in the extreme arches a single under shaft bears two upper, proportioned as truly as the boughs of a tree; that is to say, the diameter of each upper = of lower. There being [208/209] thus the three terms of proportion gained in the lower storey, the upper, while it is only divided into two main members, in order that the whole height may not be divided into an even number, has the third term added in its pinnacles. So far of the vertical division. The lateral is still more subtle. There are seven arches in the lower storey; and, calling the central arch , and counting to the extremity, they diminish in the alternate order, a, c, b, d. The upper storey has five arches, and two added pinnacles; and these diminish in regular order, the central being the largest, and the outermost the least. Hence, while one proportion ascends, another descends, like parts in music; and yet the pyramidal form is secured for the whole, and, which was another great point of attention, none of the shafts of the upper arches stand over those of the lower. §16. It might have been thought that, by this plan, enough variety had been secured, but the builder was not satisfied even thus: for and this is the point bearing on the present part of our subject always calling the central arch a, and the lateral ones b and c in succession, the northern b and c are considerably wider than southern b and c, but the southern d is as much wider than the northern d., and lower beneath its cornice besides; and, more than this, I hardly believe that one of the effectively symmetrical members of the facade is actually symmetrical with any other. I regret that I cannot state the actual measures. I gave up the taking them upon the spot, owing to their excessive complexity, and the embarrassment caused by the yielding and subsidence of the arches. Do not let it be supposed that I imagine the Byzantine workmen to have had these various principles in their minds as they built. I believe they built altogether from feeling, and that it was because they did so, that there is this marvellous life, changefulness, and subtlety running through their every arrangement; and that we reason upon the lovely building as we should upon some fair growth of the trees of the earth, that know not their own beauty. 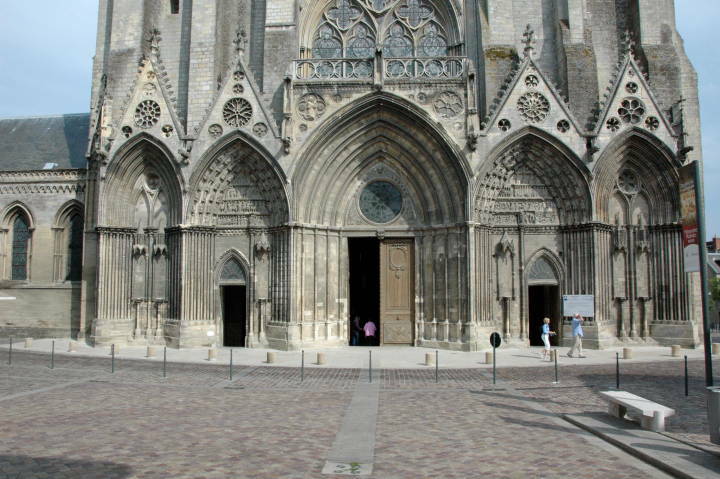 The West Front of the Cathedral of Bayeux. § 17. 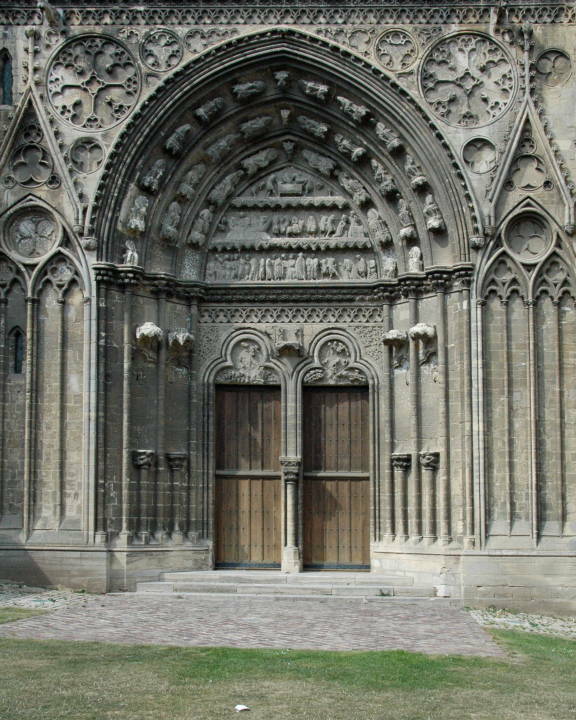 Perhaps, however, a stranger instance than any I have yet given, of the daring variation of pretended symmetry, [209/210] is found in the front of the Cathedral of Bayeux. It consists of five arches with steep pediments, the outermost filled, the three central with doors; and they appear, at first, to diminish in regular proportion from the principal one in the centre. The two lateral doors are very curiously managed. The tympana of their arches are filled with bas-reliefs in four tiers; in the lowest tier there is in each a little temple or gate containing the principal figure (in that on the right, it is the gate of Hades with Lucifer). This little temple is carried, like a capital, by an isolated shaft which divides the whole arch at about f of its breadth, the larger portion outmost; and in that larger portion is the inner entrance door. This exact correspondence, in the treatment of both gates, might lead us to expect a correspondence in dimension. Not at all. The small inner northern entrance measures, in English feet and inches, 4 ft. 7 in. from jamb to jamb, and the southern, 5 ft. exactly. Five inches in five feet is a considerable variation. The outer northern porch measures, from face shaft to face shaft, 13 ft. 11 in., and the southern, 14 ft. 6 in. ; giving a difference of 7 in. on 14 1/2 ft. There are also variations in the pediment decorations not less extraordinary. §18. I imagine I have given instances enough, though I could multiply them indefinitely, to prove that these variations are not mere blunders, nor carelessnesses, but the result of a fixed scorn, if not dislike, of accuracy in measurements; and, in most cases, I believe, of a determined resolution to work out an effective symmetry by variations as subtle as those of Nature. To what lengths this principle was sometimes carried, we shall see by the very singular management of the towers of Abbeville. I do not say it is right, still less that it is wrong, but it is a wonderful proof of the fearlessness of a living architecture; for, say what we will of it, that Flamboyant of France, however morbid, was as vivid and intense in its animation as ever any phase of mortal mind; and it would have lived till now, if it had not taken to telling lies.35 I have before noticed the general difficulty of managing [210/211] even lateral division,36 when it is into two equal parts, unless there be some third reconciling member. I shall give, hereafter, more examples of the modes in which this reconciliation is effected in towers with double lights:37 the Abbeville architect put his sword to the knot perhaps rather too sharply. 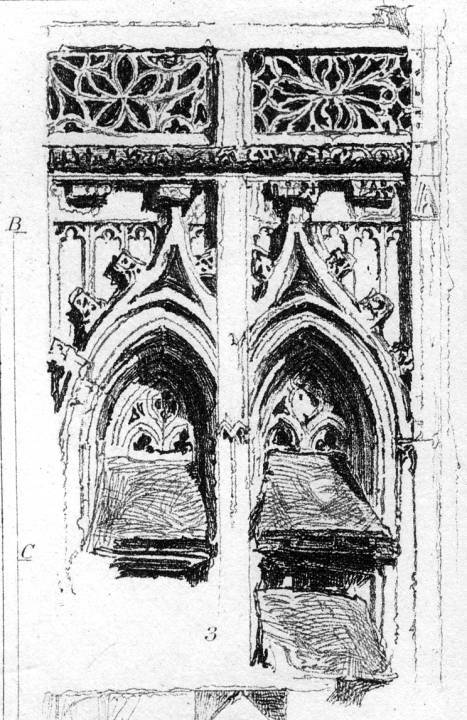 Vexed by the want of unity between his two windows, he literally laid their heads together, and so distorted their ogee curves, as to leave only one of the trefoiled panels above, on the inner side, and three on the outer side of each arch. Plate XII, Fig. 3. Window in the towers of Abbeville. The arrangement is given in Plate XII., fig. 3. Associated with the various undulation of flamboyant curves below, it is in the real tower hardly observed, while it binds it into one mass in general effect. Granting it, however, to be ugly and wrong, I like sins of the kind, for the sake of the courage it requires to commit them. In Plate II. (part of a small chapel attached to the West front of the Cathedral of St. Lô), the reader will see an instance, from the same architecture, of a violation of its own principles for the sake of a peculiar meaning. If there be any one feature which the flamboyant architect loved to decorate richly, it was the niche it was what the capital is to the Corinthian order; yet in the case before us there is an ugly beehive put in the place of the principal niche of the arch. I am not sure if I am right in my interpretation of its meaning, but I have little doubt that two figures below, now broken away, once represented an Annunciation; and on another part of the same cathedral, I find the descent of the Spirit, encompassed by rays of light, represented very nearly in the form of the niche in question; which appears, therefore, to be intended for a representation of this effulgence, while at the same time it was made a canopy for the delicate figures below. Whether this was its meaning or not, it is remarkable as a daring departure from the common habits of the time. § 19. 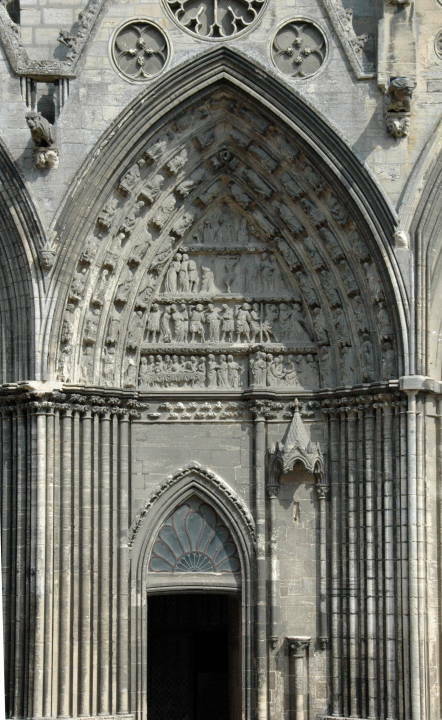 Far more splendid is a license taken with the niche decoration of the portal of St. Maclou at Rouen. The subject [211/212] of the tympanum bas-relief is the Last Judgment, and the sculpture of the Inferno side is carried out with a degree of power whose fearful grotesqueness I can only describe as a mingling of the minds of Orcagna and Hogarth. The demons are perhaps even more awful than Orcagna's;38 and, in some of the expressions of debased humanity in its utmost despair, the English painter is at least equalled. Not less wild is the imagination which gives fury and fear even to the placing of the figures. An evil angel, poised on the wing, drives the condemned troops from before the Judgment seat; with his left hand he drags behind him a cloud, which he is spreading like a winding-sheet over them all; but they are urged by him so furiously, that they are driven not merely to the extreme limit of that scene, which the sculptor confined elsewhere within the tympanum, but out of the tympanum and into the niches of the arch; while the flames that follow them, bent by the blast, as it seems, of the angel's wings, rush into the niches also, and burst up through their tracery, the three lowermost niches being represented as all on fire, while, instead of their usual vaulted and ribbed ceiling, there is a demon in the roof of each, with his wings folded over it, grinning down out of the black shadow. § 20. I have, however, given enough instances of vitality shown in mere daring, whether wise, as surely in this last instance, or inexpedient; but, as a single example of the Vitality of Assimilation, the faculty which turns to its purposes all material that is submitted to it, I would refer the reader to the extraordinary columns of the arcade on the south side of the Cathedral of Ferrara.39 A single arch of it is given in Plate XIII. on the right [fig. 2]. 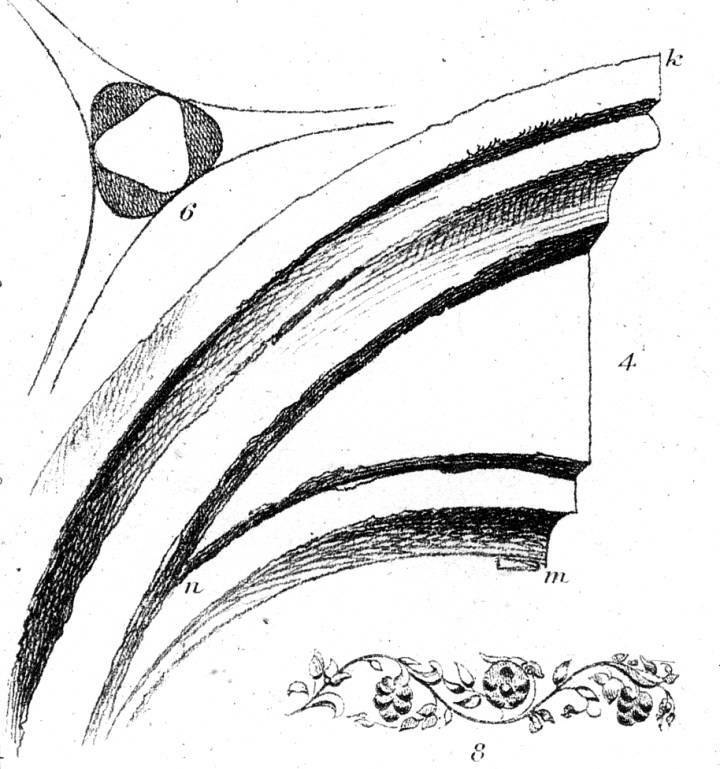 Four such arches forming a group, there are interposed two pairs of columns, as seen on the left of the same plate [fig. 1]; and then come another four arches. It is a long arcade of, I suppose, [212/213] not less than forty arches, perhaps of many more; and in the grace and simplicity of its stilted Byzantine curves I hardly know its equal. Its like, in fancy of column, I certainly do not know; there being hardly two correspondent, and the architect having been ready, as it seems, to adopt ideas and resemblances from any sources whatsoever. The vegetation growing up the two columns is fine, though bizarre; the distorted pillars beside it suggest images of less agreeable character; the serpentine arrangements founded on the usual Byzantine double knot are generally graceful; but I was puzzled to account for the excessively ugly type of the pillar, fig. 3, one of a group of four. It so happened, fortunately for me, that there had been a fair in Ferrara; and, when I had finished my sketch of the pillar, I had to get out of the way of some merchants of miscellaneous wares, who were removing their stall. It had been shaded by an awning supported by poles, which, in order that the covering might be raised or lowered according to the height of the sun, were composed of two separate pieces, fitted to each other by a rack, in which I beheld the prototype of my ugly pillar. It will not be thought, after what I have above said of the inexpedience of imitating anything but natural form, that I advance this architect's practice as altogether exemplary; yet the humility is instructive, which condescended to such sources for motives of thought, the boldness, which could depart so far from all established types of form, and the life and feeling, which out of an assemblage of such quaint and uncouth materials, could produce an harmonious piece of ecclesiastical architecture. Aphorism 25. A good work must be free-hand work.40 Compare § 24. Plate XIV. 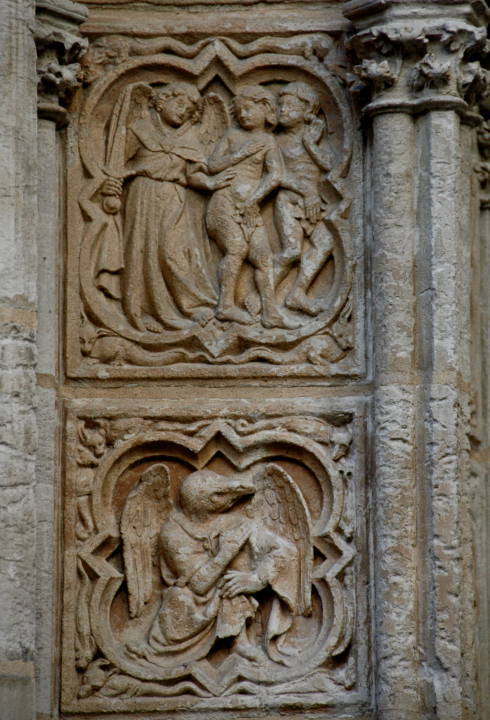 Stone carving from the North side of the Cathedral of Rouen and 2010 photograph. § 22. It is evident that, for architectural appliances, such masculine handling, likely as it must be to retain its effectiveness when higher finish would be injured by time, must always be the most expedient; and as it is impossible, even were it desirable, that the highest finish should be given to the quantity of work which covers a large building, it will be understood how precious the Intelligence must become, which renders incompletion itself a means of additional expression; and how great must be the difference, when the touches are rude and few, between those of a careless and those of a regardful mind. 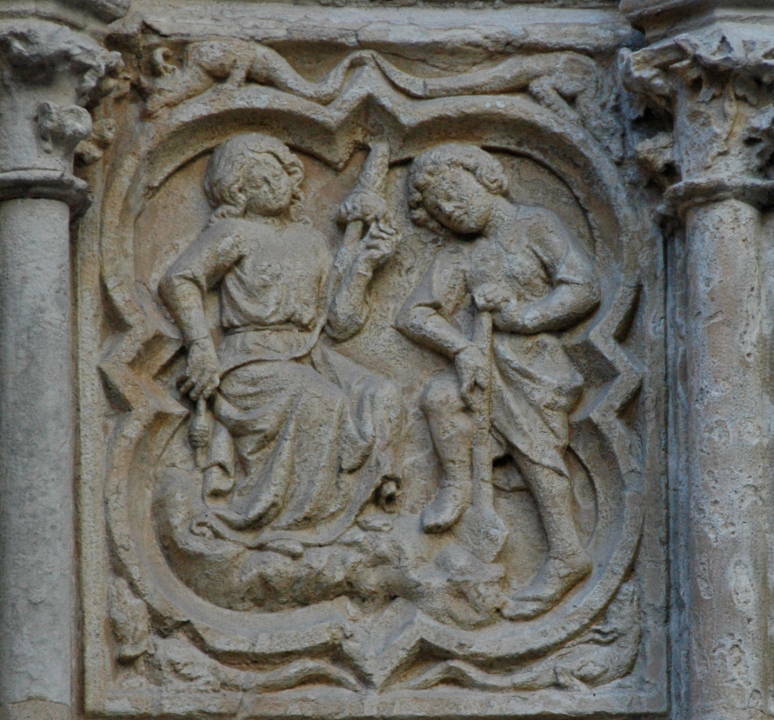 It is not easy to retain anything of their character in a copy; yet the reader will find one or two illustrative points in the examples, given in Plate XIV., from the basreliefs of the north door of Rouen Cathedral. There are three square pedestals under the three main niches on each side of it, and one in the centre; each of these being on two sides decorated with five quatrefoiled panels. There are thus seventy quatrefoils in the lower ornament of the gate alone, without counting those of the outer course round it, and of the pedestals outside: each quatrefoil is filled with a bas-relief, the whole reaching to something above a man's height. A modern architect would, of course, have made all the five quatrefoils of each pedestal-side equal: not so the Mediaeval. The general form being apparently a quatrefoil composed of semicircles on the sides of a square, it will be found on examination that none of the arcs are semicircles, and none of the basic figures squares. The latter are rhomboids, having their acute or obtuse angles uppermost according to their larger or smaller size; and the arcs upon their sides slide into such places as they can get in the angles of the enclosing parallelogram, leaving intervals, at each of the four angles, of various shapes, which are filled each by an animal. The size of the whole panel being thus varied, the lowest two of the five are tall, the next two short, and the uppermost a little higher than the lowest; while in the course of bas-reliefs which surrounds the gate, calling either of the lowest two (which are equal) , and either of the next two b, and the fifth and sixth c and d, then d [216/217] (the largest) : c:: c: a:: a: b. It is wonderful how much of the grace of the whole depends on these variations. grotesque. 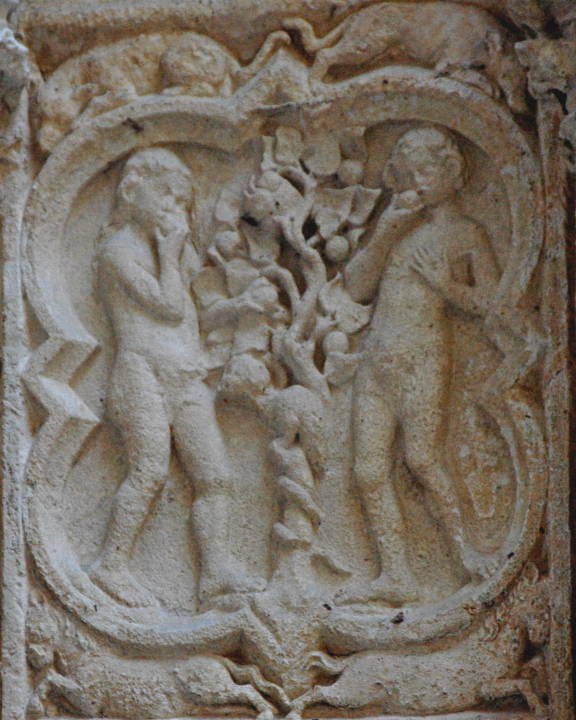 Middle: Adam an Eve eat the apple. Right: Adam deleves and even spins. § 23. Each of the angles, it was said, is filled by an animal. 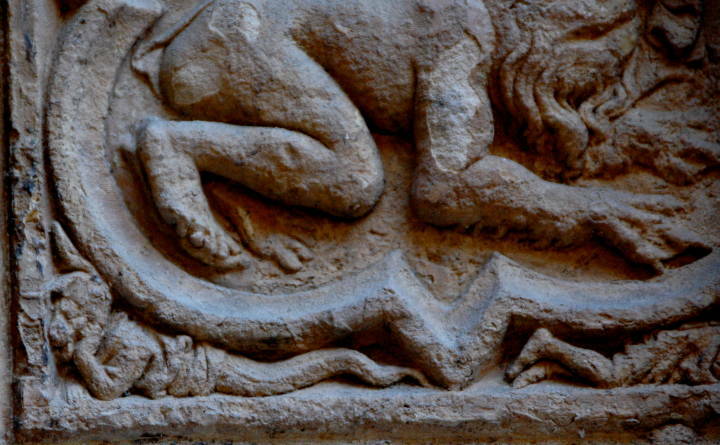 There are thus 70 x 4 = 280 animals, all different, in the mere fillings of the intervals of the bas-reliefs.45 Three of these intervals, with their beasts, actual size, the curves being traced upon the stone, I have given in Plate XIV. § 24. I believe the right question to ask, respecting all ornament, is simply this: Was it done with enjoymentwas the carver happy while he was about it?47 It may be the hardest work possible, and the harder because so much pleasure was taken in it; but it must have been happy too, or it will not be living. How much of the stone mason's toil this condition would exclude I hardly venture to consider, but the condition is absolute. There is a Gothic church lately built near Rouen,48 vile enough, indeed, in its general composition, but excessively rich in detail; many of the details are designed with taste, and all evidently by a man who has studied old work closely. But it is all as dead as leaves in December; there is not one tender touch, not one warm stroke on the whole façade. The men who did it hated it, and were thankful when it was done. And so long as they do so they are merely loading your walls with shapes of clay: the garlands of everlastings in Père la Chaise are more cheerful ornaments. You cannot get the feeling by paying for it money will not buy life. I am not sure even that you can get it by watching or waiting for it. It is true that here and there a workman may be found who has it in him, but he does not rest contented in the inferior work he struggles forward into an Academician; and from the mass of available handicraftsmen the power is gone how recoverable I know not: this only I know, that all expense devoted to sculptural ornament, in the present condition of that power, comes literally under the head of Sacrifice for the sacrifice's sake, or worse.49 [218/219] believe the only manner of rich ornament that is open to us is the geometrical colour-mosaic, and that much might result from our strenuously taking up this mode of design. But, at all events, one thing we have in our power the doing without machine ornament and cast-iron work. All the stamped metals, and artificial stones, and imitation woods and bronzes, over the invention of which we hear daily exultation all the short, and cheap, and easy ways of doing that whose difficulty is its honour are just so many new obstacles in our already encumbered road. They will not make one of us happier or wiser they will extend neither the pride of judgment nor the privilege of enjoyment. They will only make us shallower in our understandings, colder in our hearts, and feebler in our wits. And most justly. For we are not sent into this world to do any thing into which we cannot put our hearts. We have certain work to do for our bread, and that is to be done strenuously; other work to do for our delight, and that is to be done heartily: neither is to be done by halves and shifts, thy hand findbut with a will; and what is not worth this effort is not to be done at all. Perhaps all that we might;" and have to do is meant for nothing more than an exercise of the heart and of the will, and is useless in itself; but, at all events, the little use it has may well be spared if it is not worth putting our hands and our strength to. It does not become our immortality to take an ease inconsistent with .its authority, nor to suffer any instruments with which it can dispense, to come between it and the things it rules: and he who would form the creations of his own mind by any other instrument than his own hand, would also, if he might, give grinding organs to Heaven's angels, to make their music easier. There is dreaming enough, and earthiness enough, and sensuality enough in human existence, without our [219/220] turning the few glowing moments of it into mechanism; and since our life must at the best be but a vapour that appears for a little time and then vanishes away,51 let it at least appear as a cloud in the height of Heaven, not as the thick darkness that broods over the blast of the Furnace, and rolling of the Wheel.